2018 Update: We still stand by this discussion of comfortable flats every professional should own — you may also want to check our more recent discussion on cute flats for the office for more updated brand and style options. Which are the most comfortable flats very professional should own? We did a roundup of the most comfortable ballet flats a while ago and a lot of readers noted that they’ve never found ballet flats to be that comfortable. I get it, trust me — I’ve said for years that personally I prefer strappy flats. So if you hate ballet flats, but still struggle to find comfortable heels, which ARE the most comfortable flats for work? Today, we’re rounding up four types of comfortable flats every professional should own — other than ballet flats. The Strappy Flat . I’ve said for years that this is my preferred kind of flat — an ankle wrap, a T-strap, a more elaborate lace-up situation like a Ghillie shoe — I’ll take any of them. Pro tip: make sure you’re comfortable with how it buckles or fastens (personally I prefer ones that zip up the back of the shoe, but sometimes the zipper can dig). Other tips: for the most flattering look, watch where the straps hit — for some reason straps that hit higher, at the skinniest point of my ankle, seem to look the best. If you can find them, look for ones that have a strap that’s close to your skin tone, or where the strap has a slight shape of a V on your leg instead of a straight line across your ankle. For the most sophisticated, sleekest look, watch the way the toes are shaped and where the shoe hits the top of your foot (the vamp) — the rounder the toe and higher the vamp, the frumpier the shoe (in general). The pictured strappy flats are getting rave reviews, and are only $119. The Sleek Loafer. Loafers have come a LONG way since the days where you actually put pennies in them — there are a number of sleek models out here. Personally I can’t wear them (narrow ankle, wide toes), but from a fashion perspective these can look great with a pencil skirt, shift dress, ankle pants, or more. (For some reason I think they look a bit dowdy with full-length pants, but that’s me.) Look for cutouts on the side, a soft but firm leather, and a sole that doesn’t slip for you — and avoid a “slipper” look as much as possible for a sleek work look. 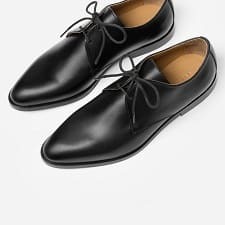 The pictured shoes have rave reviews at Nordstrom and are only $55; we’ve also sung the praises of these popular Kate Spade loafers in the past as well as the Everlane loafers. The Foldable Flat. To be totally clear, if a flat can fold it’s probably not an “all day” sort of look — but these can be amazing “savior shoes” when your other shoes are killing you. Because they’re foldable and super lightweight you can throw them in pretty much any bag — I’ve even stuffed them in a clutch. There’s a huge range of prices here — Amazon has options as low as $5 (your local drugstore probably does too), while other people swear by $200+ versions like Tieks (Tory Burch and Kate Spade both have options as well!). The middle tier option that I’ve heard great things about is the pictured one from Yosi Samra, generally $89ish new (but find it on sale in select colors at Nordstrom and Amazon for as low as $35). Readers, what are your favorite flats to wear to work — and which do you think are the most comfortable flats every professional should own? Pictured at top and in Pin: Deposit Photos / © belchonock. Browse the internet. Make a to do list. Force myself to do the essentials and just try to make it up the next day. I surf the internet, and if I find any thing relavant to my cleint’s, I can bill them for my time, so I always do a GOOGLE search for WC issues that take some time, so I can get my required billieng’s in. YAY!!!! I 100% disagree with the idea that anyone should own any of these four types of shoes, much less all of them. I own none of the above and seem to make do just fine. I hate being told I should own four pairs of shoes that serve the same purpose. What? It’s a trendy way to phrase headlines, but it sure grates. +1 Hate “mandatory” lists like this. +1 I can’t wear most pointy-toed shoes because of the structure of my feet. Guess I’m destined for looking frumpy in round toes? I just got the most comfortable loafers ever: Allbirds. I have their loafers and their other style. Just like slippers. Loafers? I thought there was only a gym shoe. Mine are on their way! Happy to hear you like them! I know they say Allbirds are for wearing without socks, but can I wear them with socks if I want to? Will they be too tight? How do you wear them? Are the black ones dressy enough for a business casual office? Thanks!! I wear the style with laces with socks and the loafers without. I think you could wear the loafers with socks. The wool stretches and shinks to fit (as I learned when I forgot socks and had to wear the first pair sockless). I think the loafers are dressy enough for a biz casual office. I am in the Silicon Valley and worked in a law firm. The lace-ups are more casual: I’d wear them if I worked in a tech company and for casual Friday in a law firm. I have those Vince Camuto perforated loafers in black and I am wearing them today. LOVE them. I exclusively wear flats and own none of the above. 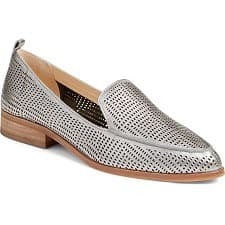 I live in ballet flats with arch support (see land’s end or LL bean) and brown and black pairs of penny loafers (soft leather, nike air cushion, several years old – would not call them sleek) from Cole Haan. In the winter I mix in Frye riding boots. I have one pair of pointy-toed patent flats from Calvin Klein for “full suit” days that kill my heels and are only worn when absolutely necessary, but I also haven’t worn a full suit to work in probably 2 years. It’s p0inty toe flats or GTFO for me. I haven’t quite figured out how to pull off loafers yet. For me, it’s all in the ankle pants. One time I wore my loafers with a dress and it just felt…odd. I have a pair of pointy toed loafers from the J Crew outlet and I adore them. 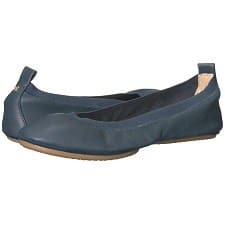 Am I the only one who is completely baffled by shoes with elastic like the foldable flat? They just dig into my heels mercilessly. I have never found a single shoe with elastic that wasnt horribly uncomfortable. Is there some special trick I’m missing? Or is my foot weird? Or do people just grit their teeth through the pain and blisters? I do not understand them. They’re uncomfortable, they look like socks, and the sole is so thin you may as well walk barefoot. And they cause cramping in my toes. How fast should shoes stretch out? I’m wearing a pair of born loafers right now that I bought around January and they’re practically falling off my feet, even though they were super-duper-painfully-tight when I bought them. Pretty much ever pair of leather flats I’ve ever owned has worn out this way as well. Is that the normal course of things? I admit I don’t rotate shoes often enough – would they stretch out less if I didn’t do that? It sounds like they don’t fit you right – you are buying them too small and the way they wear stretches them out. Every pair of Born shoes I’ve had had stretched a good half size within a year. It’s frustrating,because they’re well-made and comfortable. And only two of the shoes in the last collection are actually ballet flats. All flats =\= ballet flats. Those foldable ones make my feet hurt just looking at them. Vionic all the way. Agree that Vionics are really comfy but I wish they had a little more style. I found arch supports by Pemag at Amazon and wear them in all my shoes. They can make an otherwise really uncomfortable shoe work very well for me. I only wear AGL flats with sole savers. Got my first pair in 2013 for post knee surgery rehab months. I keep a navy pair in my desk and a black pair goes back and forth from office to home. DC area commuting perils, including dirt, grime, people stepping on my feet, tend to rule out most sandals. Can anyone recommend flats for wide feet that are still stylish? Seconding the plea for these. I rotate through the old style Talbolts flats (when they were still round toe) and Land’s End, but both still have a tendency to rub on the inner side of my foot, and neither are particularly stylish. However, they come in wide, which means at least they go on my feet! Clarks or Aerosoles tend to have comfortable flats that look simple & classic. Not super trendy, but they’ll go with anything. Often available in wide widths & in half sizes, great when you have to be on your feet for a long time. I have wide feet also. I always look for shoes with very soft leather because that will “give” better than stiff leather, and I use a shoe stretcher to stretch them out. It works pretty well. While I own a lot of flats, I don’t wear them a lot at work because I feel like they make me look dowdy. When wearing a dress or skirt, a heel, even a small one, elongates your legs and looks so much better. I would never wear a loafer with a dress. When I do wear flats, it is usually with an ankle length pant and its because the pant is not the right length for heels. I also wear flats when I need to do a lot of walking, like an event outside the office. When I first buy a shoes, I commute in sneakers and break them in at the office. Once I determine they are comfortable and broken in, then I will wear them to walk longer distances outside the office. I always buy a slightly pointed flat. I have wide feet and a pointed flat is no problem. Yes, there are some pointy toed shoes that are made poorly and hurt, but that is the fault of the shoe, not a person’s wide foot and it is not hard to spot those when trying on shoes. I always find cute slightly pointed flats at TJ Maxx, Marshalls, and DSW. Honestly, I find it harder to find a good work appropriate heel. I don’t understand the need for fold up ballet flats. Just wear a flat shoe. If you are going somewhere that requires you to wear a high heel and you don’t have a car, then get a cab and call it a day. Also, those oxfords are hideous. Why do you want to look like a man?